Present right from the first level, they are rather resistant. They launch small orange bubbles that explode when touch it. Be careful not get taken in the air by them! They fly over the water and head straight on you. Confined in submarines cages, they emerge to try to eat you. Even if they fail, they will annoy for a short time. To my knowledge, it is impossible to kill these giant beasts. In any case, each of these charming creatures has a name, plastered on his door. They try to devour you and also launch some pollen you have to avoid at all costs! They are very slow, but tough. You will have to shoot them several times before they finally die. Zombies can contaminate both civilians and soldiers. In any case, they will try spit on you in order to zombify you! If they succeed, then you turn into a zombie, you're slow, you can't carry weapons other than the basic Beretta base, but - and this is where it gets interesting - when you want to throw a grenade, instead it's a big blast of red blood that comes out of your mouth and kill all enemies in front of you. In addition, as a zombie you become invulnerable to soldiers' bullets. But if you are touched a second time by a zombie or if a soldier uses a knife to kill you, you are this time definitely dead. There is of course an antidote to get back to a normal state. Coming straight from Afghanistan, these suicidal guys will not hesitate to come close to you for exploding with their TNT or commit suicide with their planes connected to a cable. These are more traditional enemies, such as soldiers. 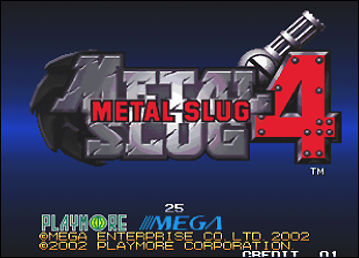 Metal Slug 4 is considered by many fans as the black sheep of the series. Indeed, this is the not the same team as usual who made this episode, but Mega Enterprise -a South Korean team- assisted by Noise Factory. This time, a cyber-terrorist organization names Amadeus tries to take control of the world (a quite original purpose). Of course, our "friend" General Morden is once again involved in the story, and you still have destroy his (neverending) army. But your real enemy is the businessman from whom you stole the briefcase in a previous episode.... don't you remember him ? The business man discussing a contract in hand, with a Maghreb merchant in Metal Slug 2 ... The same man who yelled at a boy in China, the beginning of the fourth stage in Metal Slug X! Speaking about characters, Tarma and Eri are excluded from the game and leave the place for Trevor and Nadia, two new heroes. However, we can still see them during the game, especially during a chase. The backgrounds are mostly dull and taken back here and there from past episodes. Sometimes you will be able to choose a different path, like in Metal Slug 3. This episode four still brings some new features, including the dreaded Double Heavy Machine Gun and a few new vehicles: the Forklift; the Bradley, the missile-launcher vehicle of the enemy; the Metal Claw, a quite big vehicle that can push your enemies, and the Walk Machine, a kind of mechanical wolf that replaces the Camel Slug. There's some funny and sympathetic passages: during the first mission, a hostage drives a sidecar and as a passenger you'll have to blast the enemies all around you. Tarma your buddy will arrive in reinforcements in a plated van, and you'll have to protect him as much as possible. Descent with a rope in the last mission, à la Impossible Mission, is also a highlightof the game. Regarding the enemies, no more shellfish and crustaceans on the deserted beach, aliens on earth or in space, or even carnivorous plants. Too bad, you will now only have to deal with soldiers, zombies and mummies, but also some hackers throwing swords, or scientists trying to turn you into a monkey. On the last stage, you'll also encounter a variety of T-800 Terminator you'll have to fill with bullets to stop. For me, Metal Slug 4 is a good episode, insofar it is a sort of synthesis of what Nazca and SNK have done before. Metal Slug 4 might be disappointing for players that were accustomed with the first episodes, as the game isn't looking and feeling as good as the past ones. Its difficulty is high and requires a new way to play to come through.